I think this chocolate zucchini brownies recipe is my new favorite brownie recipe and maybe even my favorite zucchini recipe! It was heavy too – had to use some muscle to hold it with one hand. 😉 I scraped out the soft, seedy part and started shredding. ELEVEN cups of finely shredded zucchini, people! We were missing one though…chocolate zucchini brownies. Off I went to research recipes and then into the kitchen to start using up that zucchini. It all started with a lot of research and testing. I tried a few different recipes, but nothing was satisfying my desire for the perfect zucchini brownie. To me, a brownie needs to be dense, chewy, and chocolatey. The inside should be moist, and I like the outside to have a slight crust. Quite the list of demands, huh. Anyway, some of the recipes I tried ended up more like a cake, but we’ve already shared a great recipe for zucchini cake. Another recipe resulted in brownies that were too thin and oily for my taste, although still pretty tasty. So I made a few tweaks, used up more of that zucchini, and now I can say that I have found my best zucchini brownies recipe! I hope you like them too! To squeeze the excess moisture from the shredded zucchini, I like to place it in the center of a clean dish towel, bring the corners of the towel together so it makes a little zucchini bag, then squeeze over the sink three or four times. For this recipe, the zucchini doesn’t need to be all the way dry, but it shouldn’t be dripping wet either. I use a 9×9 baking pan, but you can try using an 8×8 if you want to. The brownies will be a bit thicker, so you may need to adjust the baking time. You might also want to use a bit less frosting, or maybe not. 😉 You can also try doubling the recipe for a 9×13 pan. If you’re looking for a zucchini brownie in which you can taste or see the zucchini, this is not the one for you. The zucchini blends in really well, so you can barely even see it. As for the flavor, I would never guess there is zucchini in the brownie just from tasting it! For that reason, these healthy zucchini brownies would be perfect to give to kids. OXO Silicone Whisk – I love using this whisk any time a nonstick surface is involved. Don’t want to scratch my pans! Preheat oven to 350 degrees. Line a 9x9 baking pan with foil and lightly spray with nonstick cooking spray. In a medium saucepan over medium low heat, combine oil, chocolate chips, and cocoa, whisking or stirring occasionally, until chips are melted and mixture is smooth. Remove from heat and whisk in the sugar. Then add the eggs and vanilla, and whisk until combined. Stir in the zucchini. Fold in the flour, baking soda, and salt, until batter is well-combined, but don't over mix. Spread batter into prepared pan and bake for 20-25 minutes, or until a toothpick inserted in the center comes out clean or with only a few moist crumbs. While the brownies bake, melt together the butter, cocoa, chocolate chips, and milk in a small or medium saucepan over medium low or low heat. Remove from heat and whisk in the vanilla and powdered sugar, until combined and smooth. When the brownies come out of the oven, pour the frosting on and spread it evenly over the top. Cool for 5-10 minutes, then lift foil to remove brownies from pan, cut into pieces, and serve. Double the recipe for a 9x13 pan and bake for 35-40 minutes. Those look yummy Melanie! That was a ginormous zucchini! Glad you can use the zucchini. I want to see a picture of your zucchini. Did you put it on your Facebook? Your mom is cute. I usually don’t leave comments but this brownie though! They are wonderful with or without the frosting. This is now my new go-to for brownies. I doubled the recipe to make a 9×13 like suggested. I baked it somewhere around 40ish minutes. So moist & fudgy. And I agree, I need my brownies to be brownies not cake! Thanks a million! Thanks for your comment, Robin! And thanks for letting us know how it worked out for you to double it in a 9×13. So glad you tried it and liked it! Yay! If you double recipe for 13 x 9 pan do you know how much you would adjust baking time?? I haven’t personally tried it yet, but another reader commented that she doubled it in a 9×13 and baked it for about 40 mins or so. Let me know how it goes! I doubled mine for a 9×13 pan, baked 35-40 mins. they turned out moist and marvelous!!! Best Brownies Ever!!! Love them!!! Do you need to peel the zucchini? I usually just great them with the peel on. 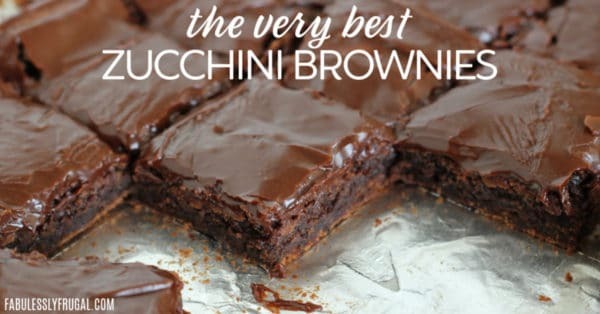 I just made your Zucchini Brownies and I had to leave a comment… Those are the most delicious brownies I have EVER had!! My 5 year old granddaughter ate 2 as soon as I could cut them!! I will always make them.. Thank you so much for sharing, a five ⭐️⭐️⭐️⭐️⭐️ recipe!!!! Hooray! Thank you so much for your comment! Glad you enjoyed them, Angie! I’m glad they still turned out great! Thanks, Linda! These are the best brownies ever. I made them first as written, and the second time I doubled the recipe. Divine! Gave one to my dad and he said they were so sinful I should go to confession! Lol! He completely forgot there was any zucchini in them! That is awesome! A sinfully delicious way to use up some zucchini! Thanks, Laura! Best Brownies Ever!! My husband says so too. So moist and flavorful!! Step 4 you mention butter but I only see oil listed. Hi, Veronica! The butter is listed in the frosting ingredients. Hope that helps! Can you use oatflour instead of white flour? Love the brownies but when I added the milk to the icing mixture it started chunking up and was a dry blob. I was reluctant to add the milk as I know when water gets into melted chocolate it will ruin it. How come this happened to no one else? I am loving the brownies but the icing isn’t smooth at all and chunks up the same. I’ve made it three times same result. What are we doing wrong? Your heat is probably too high. You have to melt chocolate slowly and at a low to medium heat or it will seize. Once it gets to that point it is hard to get it back to liquid form. Thank you so much for replying. I will try that next time. Would it matter if I used cream instead of milk? Also the nieces and nephews of mine were refusing to eat them but I said just try…they did and loved them. Even asked if I would leave them some for the next day. Glad I doubled the recipe. Yum, yum. Just made these and they are fabulous! Hooray! Thank you for your comment and review, Ann! I’ve never left a comment about a recipe before, but I have to now. Just made them tonight to use up my some of my bounty of zucchini and have to say these are THE BEST BROWNIES EVER! A little work, but we’ll worth it. Was planning on taking them to work for my coworkers, but I’m having second thoughts. Good thing I have plenty more zucchini coming! Any idea how they would freeze? Thinking they would be a great Christmas gift. Never had good luck freezing zucchini for later use & don’twant my bounty to go to waste. Ideas? Thank you for your comment and review, Sue! Let me know if you try freezing them! These are absolutely delicious! Great way to sneak vegies to the kids! Do you think milk chocolate chips would be ok instead of the semi sweet? I am sure that it would be okay! It might seem a little sweeter though! Give it a try and let us know how it goes? Hey, i could even turn out to be better!! I haven’t made these with milk chocolate chips before. It would probably work, but it will obviously change the flavor a bit! Please come back and let us know how it goes if you try it! Thanks! I don’t usually leave reviews, but this is worthy of one! Seriously the best brownie I’ve ever eaten (and definitely made)! So moist and the frosting is amazing. I was nervous they they would be too runny when they first came out of the oven, but they firmed up pretty quickly and didn’t lose any moisture after cooling. I used an 8×8 pan and baked it for about 27 minutes. Yay! So glad they turned out wonderfully for you. Your comment is making me wish I had some right now! Thank you for your review! Has anyone tried freezing these? Would you freeze with/without icing? Tia!! I haven’t tried freezing these brownies before, but I think it would probably work. I freeze chocolate cookies all the time with success! The risk is that it might dry them out a bit. I would try freezing them without the frosting. Please come back and let us know how it goes if you try it! Yay! Glad you like them! Thank you for your comment, Bhavna. Without a doubt the best brownies I’ve ever eaten. And the fact that there’s shredded squash hidden away is awesome. Even my grandson who hates veggies ate these. Thank so much for sharing. Will be making these again!!! I usually never write reviews but I just made these brownies. And man are they delicious! We are currently missionaries in Kenya and don’t get a lot of sweet brownie mixes but having this from scratch is such a treat! They were so easy to make and I’m excited to make them again! Hooray! So glad you like them. That is fun to think that these brownies are being enjoyed all the way in Kenya too. 😉 Thank you for your review, rheanna. This is an awesome recipe for brownies, so good. Thanks, Shelly! Glad you like them. Can u freeze these and frost them later ? Hi, Lisha. I haven’t tried freezing these brownies before, but it might work (without the frosting). The risk is that freezing might dry them out a bit. Please come back and let us know how it goes if you try it! I have been searching for a zucchini brownie recipe for years that tasted like a brownie and not cake. This is the one! I did double my batch and made a 13x9pan. I baked them for 35 minutes, but could of probably baked them less time. I think next time I will bake for 30 minutes, check them and add more time if needed. Everyone in the house loves them! Yesss!!! Thanks for your review, Cristie. So happy that you like the recipe! OOOOOMMMMMGGGGGG! These brownies were melt in your mouth unbelievably delicious. Thank you! Thank you, Darcey! I’m so glad you gave them a try and like them! Awesome, Patty! I bet your bread and muffins are delicious too, but it is definitely fun to mix it up. Please let me know how it goes with freezing them! Thank you. These are the best brownies I have ever had. I will never use a box mix again.I made 2 batches and practically ate them all I told my son to stop and get some but by the time he got here there was only 1 left 😮 yes they are that good. EVERYONE LOVED THESE! I did double recipe and it was more like sheet cake (like that was a bad thing) so I think next time I’ll try a jelly roll pan and see how that plays out. But overall a true winner in my book. Thank-You so much for sharing! So glad you enjoyed that!! What’s the best way to store them? Fridge or countertop? Definitely store these in the refrigerator. They are so moist that they would mold quickly on the counter, especially in warm weather. They are amazing! I think it probably depends mostly on how long you plan to store them. They don’t last long around here, so they usually don’t make it to the fridge! I think they are fine to be out on the counter for a few days. I bet they taste deliciously chilled too though! Why is this the only post I keep getting? Hi Debby – what do you mean this is the only post you’re getting? Are you receiving emails about this post? Yes the only message I keep getting is about the best zucchini brownie recipe. Nothing else. It sounds like you are subscribed to these comments somehow. There should be an unsubscribe link at the bottom of the email you get. More info can be found here: https://en.support.wordpress.com/following-comments/. Hope that helps! I think you’re right. I just didn’t want to lose your site. Finally found the recipes only newsletter and signed up. I couldn’t figure out why I wasn’t getting other recipes except for the brownies. Lol. You have some great recipes. The coupons, etc. wouldn’t be of interest as I’m from 🇨🇦 and they wouldn’t apply here. Looking forward to the newsletter and other new recipes and hints. Thank you so much! Oh perfect Debby! I’m so glad you got it figured out! Pleased to have you here, neighbor! Loved these brownies so much- I don’t want to use a brownie mix ever again. I also loved how easy it was to mix up in one pot. I’m wondering, can these be made without zucchini? I don’t always have zucchini on hand (especially in the winter). Would you change anything about the recipe to make up for not putting zucchini in them? Thank you for your review and comment, Jenn! That is a good question…I know zucchini adds some moisture to recipes, but I don’t know how it would affect this recipe to leave the zucchini out. Definitely worth trying though! I think I would first try the recipe as is, but omitting the zucchini and see if the consistency of the batter seems similar enough to when you make it with the zucchini. If it seems thicker or too dry, then add a little liquid. Otherwise, I think it might work? Now you’ve got me all curious and I want to give it a try too!